Based on a true story, that in turn became a bestselling autobiographical book, Same Kind of Different As Me tells the story of art dealer Ron Hall (Greg Kinnear) and his wife Debbie (Renée Zellweger), who live in a big home with their two teenaged kids in Texas. When Debbie finds out that Ron had an affair, instead of letting their family fall apart, they decide to turn over a new leaf and start giving back to the world. Debbie insists they start volunteering at a soup kitchen, spurred on by a dream she has about a homeless man transforming the city. When she sees the same man (Djimon Hounsou) storm into the soup kitchen, angrily smashing things with a baseball bat in a violent rage, Debbie and Ron decide to reach out to him. They find out that his name is Denver, and that he came from a troubled background in Louisiana, having spent his life dealing with racism. Despite the fact that Denver is inherently distrustful of others, particularly white people, due to painful events in his life, Ron and Debbie are able to forge an unlikely friendship with him. 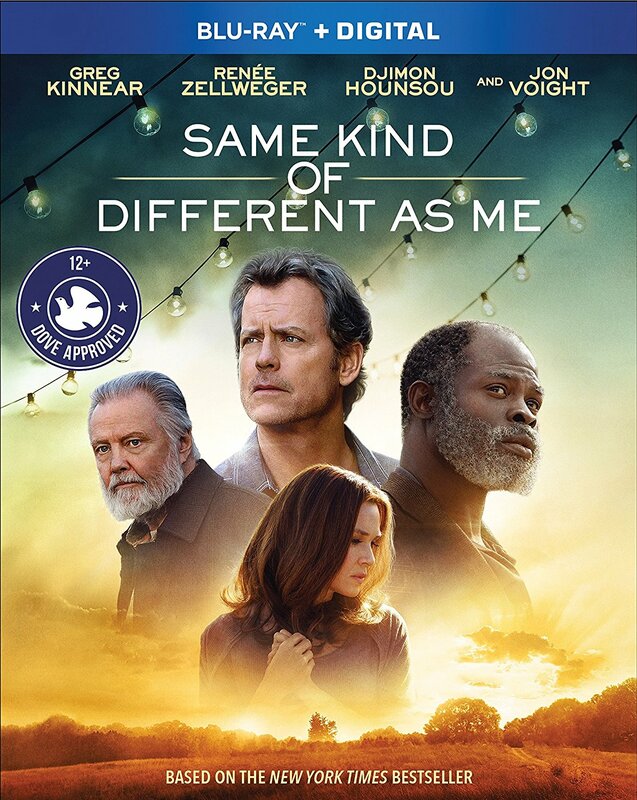 The film does feel a bit melodramatic at times, but the story behind Same Kind of Different As Me is also undeniably heartwarming and moving, and it’s propped up by powerful performances. Greg Kinnear and Djimon Hounsou in particular do excellent work here, sharing some emotional scenes together as the two men are becoming friends, and testing the limits to see how much they can trust each other. Jon Voight also delivers a nuanced supporting role as Ron’s estranged, alcoholic father. First time feature director Michael Carney has delivered a decent and tastefully done retelling of this true story, allowing his cast to do much of the dramatic heavy lifting. This is a solid feel good film, and one that is worth seeing if you’re looking for an emotional and uplifting faith-based story. The Blu-ray also includes commentary by Michael Carney and writers Ron Hall and Alexander Foard, as well as deleted and extended scenes, and the three featurettes Love is Patient, Love is Kind, The Making of Same Kind of Different As Me, and Filming in Mississippi. Same Kind of Different As Me is a Paramount Home Media release. It’s 119 minutes and rated PG.